The Blackhawks prospect camp is now in the books, and there was a lot to learn about some players that aren’t household names (yet). Some players made a great first impressions, while others weren’t as visible. Let’s look at some of the winners and losers from the last five days of hockey. The Hawks fifth round pick this year, the 19-year-old Shaw was the guy everyone wanted to see on the ice during Monday’s scrimmage. He played with an edge the entire weekend, but was controlled and effective. During Monday’s “game,” he undressed a defenseman with a ridiculous move between the d-man’s legs, and then gave up four inches and almost 30 pounds in a fight with Dylan Olsen – and it was Olsen that left to get his face put back together afterwards. On Sunday, Scotty Bowman was overheard speaking with a few other individuals in Hawks management, and the topic was how impressed the organization has been with Shaw. He only attended for three days, but Johns’ massive size (6’4, 221) was noticeable even with other big players on the ice. He skated well, handled the puck effectively and was physical as well. Oh, and he scored a goal in Saturday’s scrimmage as well. He’s already back at Notre Dame, where he’ll probably spend at least one more year, but the future is very bright for Johns. This kid’s a beast, listed at 6’5 and 233 pounds, and flies up and down the ice. He just finished his three-year career at Boston College and will join the Rockford IceHogs to begin the year, but it’s clear that he’ll be in Chicago before too long. His size and skill is something that the Blackhawks need at the highest level, but they don’t need to rush him to the United Center. Yes, Olsen is the bigger name, but Lavin spent the entire weekend in perfect position, moving the puck to exactly where it needed to be, clearing the paint and keeping people away from the net. Olsen might have the higher ceiling, but Lavin is in the same mold Ben Smith was last year. If the Hawks need someone who won’t make mistakes to fill ice time, Lavin’s probably the guy. While Mark McNeill was the headline-grabbing first round pick on Thursday, the most impressive member of this year’s draft class (other than Shaw) was Saad. He was rated by most scouts as a mid-first round talent that slid to the Hawks in the mid-second round. He’s got a big body (6’1, 203) for an 18-year-old, and uses it effectively in traffic. He also showed off smooth hands around the net, scoring a nifty goal on Monday morning. 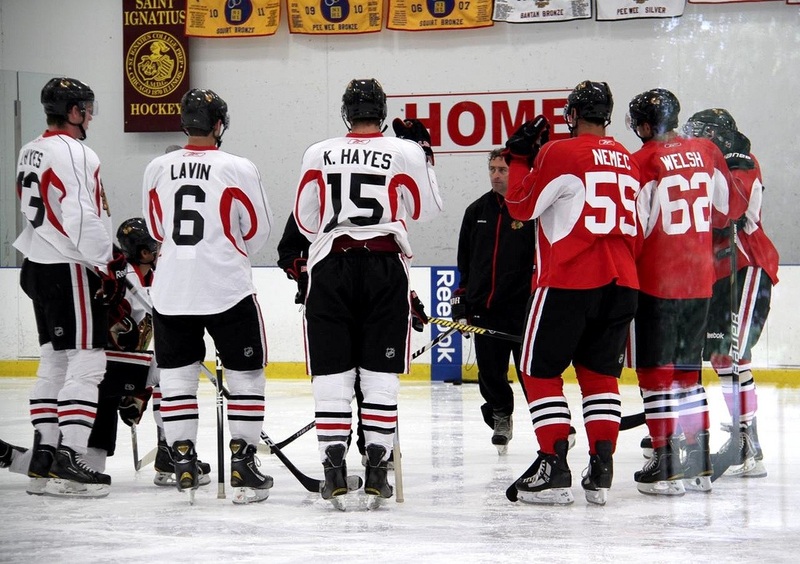 Of the group of players headed to Rockford for their first full year as a professional – Flick, Byron Froese, David Gilbert, Jimmy Hayes, Philippe Paradis, Lavin and Olsen – Flick was the strongest two-way players at the camp. He’s listed at 6’3 and 208 pounds, and uses his big frame well around the net and in corners. He’ll bring more size to Rockford’s forward group next year. Nordstrom was caught out of position on a number of occasions and fell victim to the “ice conditions” too frequently this weekend. While other prospects, specifically Rensfeldt and Paradis, showed strength and versatility, Nordstrom looked lost. After a strong showing with Indiana of the USHL (36 points in 57 games), Mattson came into a crowded group on the blue line this weekend and didn’t show much. Frankly, he was invisible, while free agent invitee Matt Petgrave made more of an impact. Heeter was a free agent invitee for the second straight year, and was solid again. He posted a good .923 save percentage at Ohio State last year, and might get a chance at the back-up job in Rockford. I just LOVE that name for a goalie, CAL HEETER! Thanks for this report, Tab! Re: Jimmy Hayes. Is he physical enough to play in the bottom six for the Hawks this year? 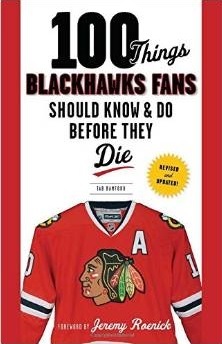 The Blackhawks don’t need him to skate int he bottom 6 this year, so he won’t.